BRONX RESIDENTS PAST AND PRESENT share many of the same concerns – education, health care, housing, infrastructure, transit. Today's post is the first in a series on the borough, exploring the variety of ways in which City government both guided and responded to the evolution of the Bronx from a rural enclave to a burgeoning metropolis, through cycles of growth and renewal. Bronx Park, circa 1880-1899. New York City Municipal Archives Collection. New York had its first Urban Open Space movement in the mid-19th century. The movement sought to provide open park space and fresh air for city residents. One of the movement’s greatest achievements was the passage of the 1884 New Parks Act by the New York State Legislature. The act funded the acquisition of the Bronx’s six major parks: Pelham Bay Park, Van Cortlandt Park, Bronx Park, Crotona Park, Saint Mary’s Park and Claremont Park – almost a quarter of the entire land area in the Bronx today. 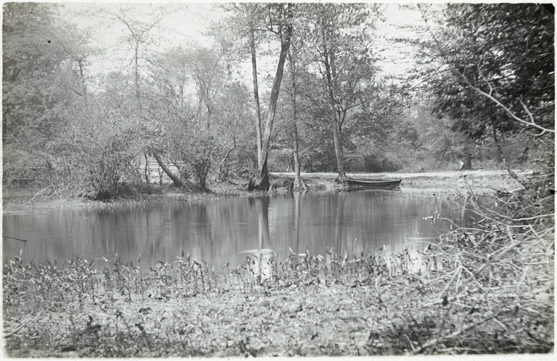 The Bronx River in the New York Botanical Garden, circa 1891-1899. NYC Municipal Archives Collection. Until the end of the 19th century, the Bronx was a rural farming area consisting of several small villages. West Farms, part of Westchester County, was created in 1846; Morrisania was created out of a division of West Farms in 1855; and Kingsbridge was divided from Yonkers in 1873. In 1869, the New York State Legislature authorized the Central Park Commissioners to survey these lands, which were then still part of Westchester County, with the goal of laying out streets within the area. When New York City government reorganized in 1870, the Central Park Commissioners were transferred to the new Department of Public Parks (DPP) to continue their survey. They expanded the survey to include the part of Westchester County east of the Harlem River to Hutchinson Creek. These events significantly affected the geographic development of the Bronx as it is known today. Proposition of Pelham Bay Park, Van Cortlandt Park and Bronx Park lands, 1882. Mayor William R. Grace Subject Files. The areas outlined on these maps would eventually be acquired by the city in 1884. In 1874, West Farms, Morrisania and Kingsbridge became the first towns outside of Manhattan to be annexed to the City of New York. Additional lands east of the Bronx River, consisting of the village of Wakefield, the town of Westchester, and parts of Pelham and Eastchester, would be added in 1895, and City Island in 1896. This territory became the City’s 23rd and 24th Wards and was commonly referred to as the “Annexed District” by those living in Manhattan. 1876 letter from Hiram Barney to Mayor Wickham about making roads in the 24th Ward passable during winter. At this time, the area was under the political jurisdiction of the Department of Public Parks. Mayor William H. Wickham Subject Files. Both Manhattan political leaders and Bronx residents supported becoming part of New York City, albeit for different reasons. For the political leaders, annexation expanded the territory and the tax base. They recognized that many of Manhattan’s wealthiest residents were moving to these Westchester County villages and were no longer Manhattan taxpayers. In the 1870s, partially because of good advertising, people were attracted to the open land of the Bronx and its promise of a suburban lifestyle. However, these growing communities lacked vital resources, such as police and fire protection, passable streets, rapid transit, a reliable clean water supply and a uniform sanitation system. Residents wanted a functional political body to fully implement such necessary improvements. Because it was already surveying the region, the DPP was given responsibility for making the desired improvements a reality. However, the Department was not organized to actually complete these projects. Most of the 23rd and 24th Wards remained inaccessible and undervalued during the sixteen-year tenure of DPP control, particularly because the final plans for street openings had not been completed. The expansion of the elevated train into the Bronx in 1886 forced streets to be opened, whether they were ready or not. It became apparent to residents that a change had to be made. 1890 spreadsheet submitted by Haffen to Mayor Grant, comparing improvements completed in the 23rd and 24th Wards while under the jurisdiction of the DPP between 1874-1890, and those done under the leadership of the Department of Street Improvements, from 1891-1894. These numbers show how the Bronx territory benefited from a more localized government infrastructure. Mayor Hugh J. Grant Subject Files. Local Bronx organizations, such as the Property Owners of the 23rd and 24th Wards, lobbied for political jurisdiction to be placed under a special commissioner for street improvements. This person would be an elected official from their own locality to ensure that the best interests of the local residents were uppermost in mind. In June 1890, the DPP lost control of the Bronx and the new office—Commissioner of Street Improvements for the 23rd and 24th Wards—was established. Under the direction of the Commissioner of Street Improvements, an office that would eventually become “Borough President,” the much-needed progress began. A street layout was finalized and implemented at a quick pace. Construction on the Grand Boulevard and Concourse began, and great areas of former farmland were converted into city lots. Property values doubled between 1890 and 1895. The land was quickly turning from suburban retreat to a future urban metropolis. Maintaining a reliable source of clean drinking water was a chief concern for all residents of New York City. By the 19th century, the City’s population was rapidly growing and existing fresh water supplies were inadequate or had become polluted. City leaders were forced to look for a long-term solution, which led to the creation of the Old Croton Aqueduct System. High Bridge, part of the Croton Aqueduct. Manual of the Common Council of the City of New York, D.T. Valentine, 1861. Municipal Library Collection. Numerous problems in the engineering of the system arose in the decades following its opening. In 1874, the issue was how to supply water for the 23rd and 24th Wards. In 1875, the Common Council passed an act calling for the distribution of Croton water to the newly annexed territories. It was also decided that a reservoir should be constructed at Jerome Park where the Old Croton Aqueduct and a new aqueduct would meet. (Because of the many entities exerting oversight, the Aqueduct Commission would not formally approve the planning of the Jerome Park Reservoir until 1884.) One of the reservoir’s main functions would be to supply water in the area of the 23rd and 24th Wards, but construction was put off until 1895, as popular opinion held that it wasn’t an immediate necessity. The reservoir decades in the making was finalized for use in 1905. Resolution of the Committee on Railroads relative to the petitions received from the 23rd and 24th Wards requesting rapid transit facilities in 1879. Mayor Edward Cooper Subject Files. A rapid transit connection between the Bronx and Manhattan was essential for the Bronx to build its desired population. But it did not yet exist, partly because rapid transit was controlled at that time by private companies. Often, more time was spent fighting for control of the company itself than planning viable lines of transit. After much deliberation and planning, the Suburban Rapid Transit’s (SRT) Third Avenue elevated line, built between 1886 and 1905, became the first to serve the Bronx. The route traveled through Mott Haven to Tremont. Jay Gould, who controlled the SRT and New York, Fordham, and Bronx Railway, made a deliberate decision to build the line through the Third Avenue corridor because he saw it becoming immediately profitable. He was right – construction boomed along the line, specifically around the stations where clusters of city houses were built. Streetcars, originally horsecar, were electrified in 1892. The streetcar was owned by Union Railway Company, an organization of affluent Democrats, who had no problem getting permission to cross over the Harlem Bridge. Later on, improvements allowed lines to be built on rough train, and tracks were laid down along Boston Road, Westchester Avenue and Southern Boulevard. The improvements in transit spurred growth in particular sections of the Bronx, but many areas remained difficult to access from Manhattan. Only one rapid transit line would run in the Bronx until 1905, when the subway would finally be extended into the borough. Next time: Bronx markets, schools, and more.